This was part of Beyond Cyrodiil: Valenwood. While the work on the mainland has fallen apart, there has been a lot of progress with the isles. The project fell apart because of lack of scripters back in 2007, now the mod has found a new scripter, me. I have done a lot of changes to the original Main Quest document, far too numerous to fully mention them. While the mod is still focusing on pirates and shipwrecks, the culture of the Bosmer is fully fleshed out by complex dialogue trees with the villagers and to a lesser extent, books. The Main Quest is morally grey - it does not depict either side to be just good or bad. Both your comrades and the villagers have conflicting interests - it is up to you to decide their fate. you are dealing with. Even the minor characters have their own trees, though far less complex. reputation system - your actions will be recognised by the factions, for better or for worse. willingness to look at every nook and cranny. Go to Anvil's The Counts Arms and approach or be approached by the town crier, who will start the main quest by giving you a flier. While you go through the mod, please keep an eye on the faction reputation at all times. Your reputation can be found under Factions (the same place where you can normally view your faction ranks). It determines what paths you can and cannot follow. And please be careful when dealing with NPCs. This is not Cyrodiil where your actions can be forgiven by a slap on the wrist. Q: I ticked off (insert faction name here)and now they won't speak to me! -Pickpocket Boldur for his journal. -Investigate the abandoned house near Uldib's house. -Speak to the people in the Water Drake Tavern. Then, you will be able to activate the back path and proceed normally. Q: I failed a quest! A: Perfectly normal. You can't finish all of the quests in one playthrough, without heavy cheating. This mod requires you to play it a few times, in order for you to see everything. If a side quest failed, that means you have bad reputation with the villagers. Q: I have purple LOD! A: Use TES4LL and TES4LODGEN to get rid of the purple LOD. No incompatibilities known. 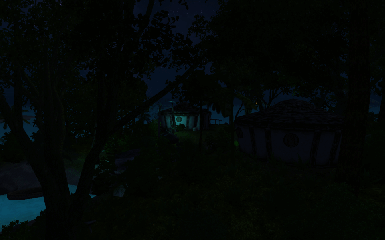 Compatible with TWMP Valenwood Elsweyr as the isles are in a separate worldspace. Also compatible with UL Cliffs of Anvil and Snowdale with the included patches. Please let me know if a mod is incompatible with Valenwood Islands and I will do my best to resolve it. -When you enter the small isle, the local map bug will kick in. As far as I've seen, this bug only happens in the small isle and nowhere else in the worldspace. This was part of Beyond Cyrodiil: Valenwood. While the work on the mainland has fallen apart, there has been a lot of progress with the isles. The project fell apart because of lack of scripters back in 2007, now the mod has found a new scripter, me. 1.0, 11/09/2014 - Initial release. 1.20, 09/11/2014 - Made the bosmer hunters non-essential, made sure that they will approach once and only before you finish the second main quest, gave Boldur a stay still package only when the first main quest isn't finished, packaged ltex files for TES4LL generation. 1.21, 10/11/2014 - Made the furniture in the locked cabin non-persistent and added a trigger zone which moves Boldur back to his original position, new basement for Emuset's house, removed the non lore-friendly bathroom stuff from there. 1.22, 11/11/2014 - Boldur's side quest is now accessible to all characters, regardless of fame or infamy. 1.23, 10/12/2014 - Fixed a bug where Archen was essential if you betrayed Sammanul, and added refusal options to Olurion. 1.24, 24/02/2015 - Deletes the edit to the Ghost Ship of Anvil. Thanks to Windsurfer, morcroft and the rest of the Valenwood Islands original team for creating the great worldspace where the story could be told. Thanks to Deeza for the original Main Quest document and lore advice. Thanks to AndalayBay for the world map and helping me to resolve scripting issues. Thanks to zilav for helping me with the LOD. this mod. If I'm unreachable within 2 weeks, then contact Deeza or AndalayBay.